January 15, 2016 | ProgressTH Whether you realize it or not, biology itself is a sort of technology. It is a set of tools that have been naturally developed to allow organisms, including us, to survive in a variety of environments. Just like a high-tech solar panel provides our homes and places of work with electricity, our biology provides our bodies with energy, as well as defenses against a long list of threats big and small, and the ability to move through and appreciate the planet we live on. Students learn how to load and program a thermocycler which heats and cools DNA, combining them with primers, to help isolate sequences of interest for further examination. Human beings have, over time, learned to use the tools of biology in a wide range of novel ways. Aspects of certain bacteria allow us to cut, copy, paste, amplify, and analyze DNA. This allows us to understand life on a molecular level, as well as re-engineer it in a variety of ways to serve our various needs. All of this is done in the molecular biology lab. At first glance, it is filled with a dizzying array of high-tech equipment, spinning, shaking, freezing, heating, pressurizing, electrifying, and illuminating test samples. The whirling of servos and the blinking of lights, along with touch screens and and the jet-like sound of spinning centrifuges might invoke feelings of a science fiction movie. It can seem intimidating, but if you have a good teacher, virtually anyone can learn to use these tools, and they can do so in a single day. KMUTT senior students and Dr. Dujduan Waraho look at the results from one of the electrophoresis gel runs. By looking at the bands produced during the runs, students were able to learn more about their blood types. That was the point of a recent workshop conducted at King Mongkut's University of Technology Thonburi by Dr. Dujduan Waraho. The workshop was conceived as part of a group of KMUTT students for their senior project. They want high school students to be able to take a 1 day workshop and get hands-on experience using the tools used in the field of biotechnology. So this workshop was basically an attempt to work out the details for the final workshop that will be used to teach high school students. The seniors themselves are studying chemical engineering, so for them, this initial workshop was as much a lesson to them, as their finished senior project will be to local high school students. We were lucky enough to be invited to take part in the workshop as well. 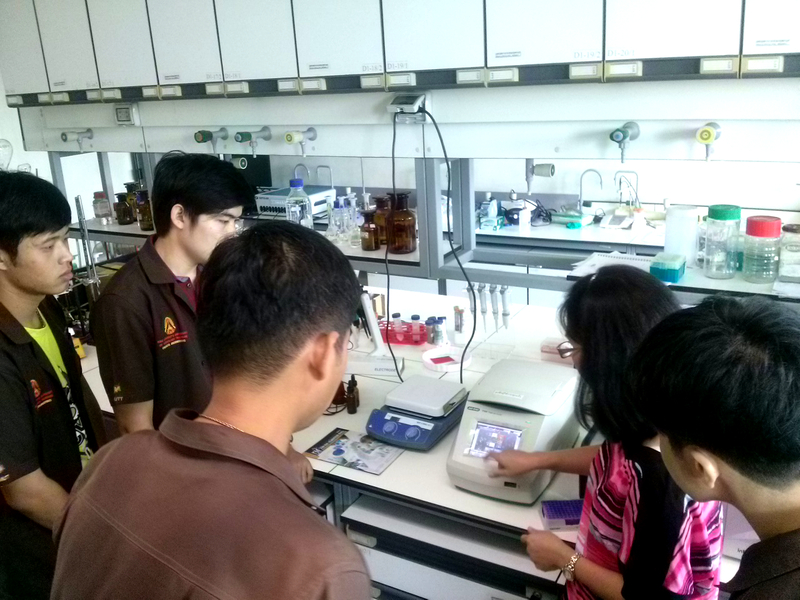 We have followed KMUTT's interest in teaching others about biotech for some time. 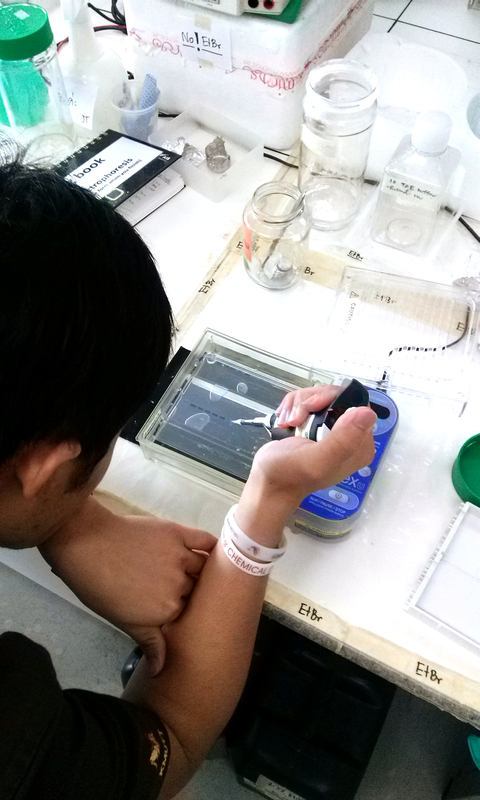 Dr. Dujduan Waraho prepares an electrophoresis gel before running our samples. The workshop was built up around trying to discover our blood type without needing to draw blood using a needle. This was accomplished by taking DNA samples from a simple saltwater mouth rinse to collect cells from our inner cheeks. The DNA was then spun in centrifuges, cut by primers through a process called thermocycling to isolate the areas that would indicate blood type, then run on a gel using electricity to separate DNA segments by their lengths. Depending on your blood type, the bands that would appear in the gel would come out differently. At least one student's results came out accurately. Throughout the 2-day workshop, we learned not only what we could do next time for more reliable and accurate results, but also how to make the entire process more efficient and less time consuming. We all already knew our blood types, but the point of the workshop was to give us an introduction into using the tools found in a modern molecular biology lab. These are the same tools being used to conduct cutting edge genetic research on humans and other organisms, as well as the same tools used to perform genetic engineering, gene therapy, forensics, and disease detection. While it takes practice and experience to use these tools effectively, with Dr. Dujduan Waraho's expert instruction, she proved that anyone can begin using them slowly, surely, and effectively, even on the first day. We all brought an interest in biology with us to the workshop, and at the end of it, we walked away with a practical, working knowledge of the tools used to explore and leverage biology for our own best interests. From here, the small team of KMUTT students will refine the protocol to make it easier and quicker for their own workshop they plan on running with high school students. For us, we plan on bringing the knowledge we acquired back to Thailand's first community lab, F.Lab, and use it to help inform the design of our community space, and to help organize future workshops to spread an interest in biotechology among regular people. F.Lab seeks to give people the tools they need to become participants and producers rather than mere spectators and consumers in this increasingly important field of technology. 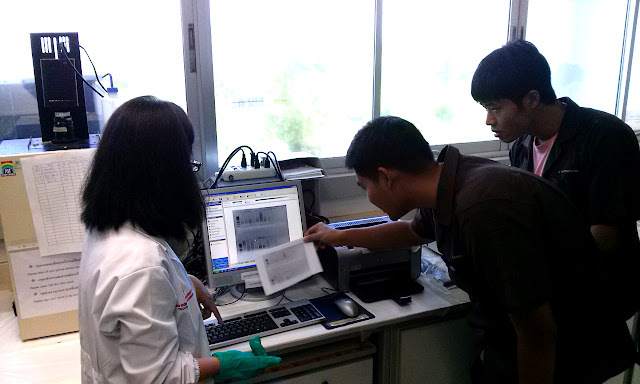 F.Lab's first project will be DNA barcoding important organic crops for farmers in Southeast Asia. It will be the beginning of a more accurate and more decentralized means of quality control. When you buy rice from a Thai farmer who has DNA barcoded their rice, you will know exactly what you are putting on your plate. Combined with an opensource auditing system being developed by other F.Lab members, Thailand's organic scene will become more transparent and dependable than ever. Working in a real lab also gives us insight into various kinds of lab equipment. F.Lab will also feature opensource DIYbio lab equipment already being developed (and in fact, already brought to and tested during the workshop at KMUTT). Seeing and working with industry equipment helps better inform the design of their opensource alternatives. 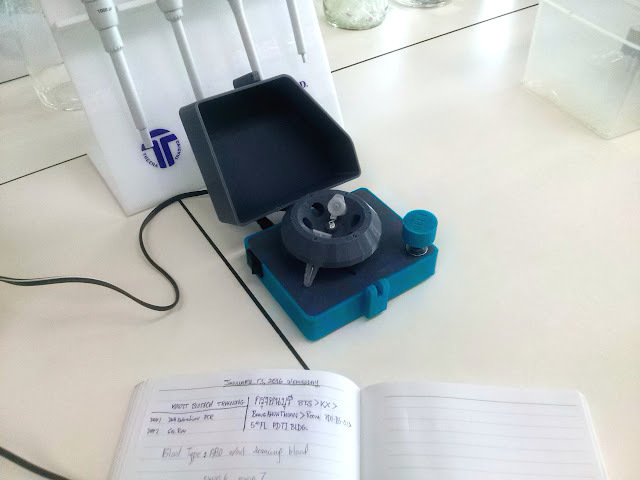 F.lab's opensource 3D printed mini-centrifuge at KMUTT's molecular biology lab. It was even used during a 'quick spin' while following the protocols. 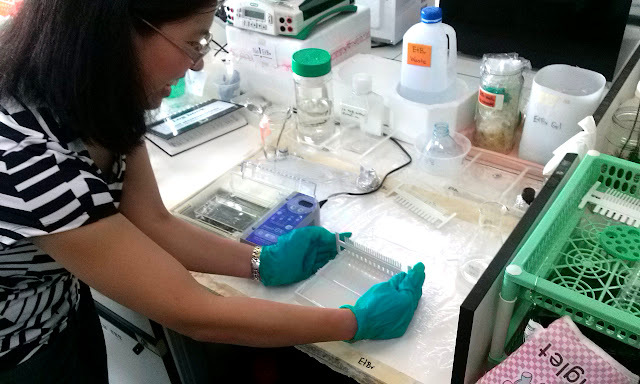 Working with real professionals in a real lab gives DIYbio enthusiasts inspiration to take their designs and ideas to the next level. If successful, both the workshops being designed and test-ran at KMUTT, and the progress being made at F.Lab, will make the field of biotechnology more accessible to anyone interested. When the tools and techniques of biotechnology are more accessible, and the practical applications more easily understood by regular people, personal biotechnology is predicted to become as big as 3D printing and before that, IT has become. If you are interested now in biotechnology, look for a DIYbio community lab near you, or get involved at your local university and see about founding your own lab yourself.